I'm happy to announce a new book of readings in physical anthropology which I edited with Dr. Eileen Jackson. 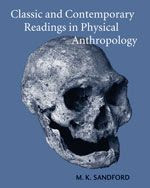 We selected readings that reflect important articles in the history of physical anthropology as well as more recent offerings that highlight new discoveries and innovative methodologies. We include the vision of physical anthropology as originally seen by its founder, Ales Hrdlicka, as well as a groundbreaking article by Sherwood Washburn on the new physical anthropology. Key articles on evolutionary theory, primates, human genetics and contemporary human variation are included. Discussion questions follow each chapter along with key terms and recommended web sites. Publication information is presented below along with a link to the publisher's website.